Close to four months ago, I posted on my dinner adventure at Soyka, located at 5556 NE 4th Court, in the 55th Street Station of the MiMo District. Soyka is a familiar staple on the Boulevard; offering a nice ambiance to just chill out and relax over some great dinner and drinks. 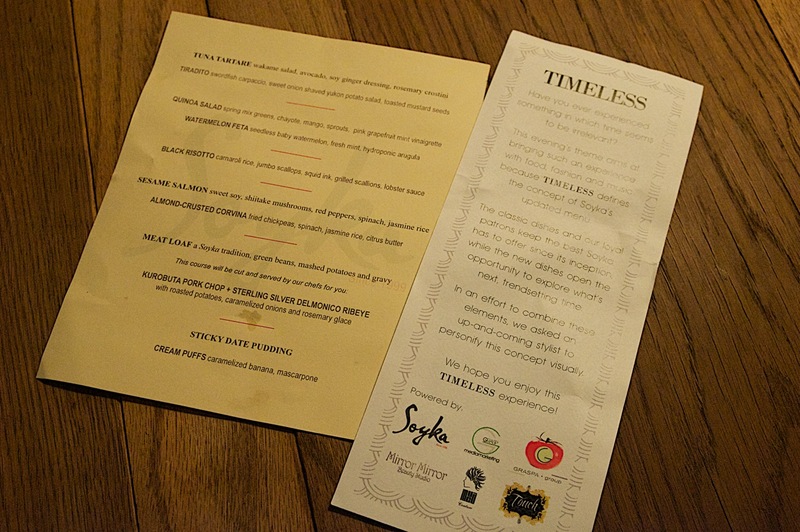 More recently on May 22nd, I was invited to attend the unveiling of their updated menu; a combination of the past and the present, the classic and the new, in an event befitting of its title: Timeless. It was an experience where the concept of time was personified through fashion, music and of course - food. We were treated to a blast from the past performance by models sporting time-honored "Roaring 20s" attire, along with a single model who represented the concept of Time. Two giant screens in the center initially played clips of old black and white movies, and then showcased Chef Christian Martin as he introduced his new dishes; engaging the crowd from "backstage". Aside from the media event, patrons who reserved and attended the unveiling between 6:00 p.m. and 9:30 p.m. not only got to be among the first to order from the new menu, but also received a $20 gift certificate to use on a future visit. As part of their vision, Soyka's updated menu now contains many of the old favorites along with some more modern creations by Chef Martin, that are expected to wow its patrons. Easily discerned, the updated menu features Soyka Classics on the left side, with the new dishes listed as The New Soyka on the right. After sampling a combination of over twelve dishes, both old and new, I'll share my favorites with you. For pictures on all the dishes I sampled during Timeless at Soyka, just check out my Facebook page at http://www.facebook.com/AdventuresoftheFoodaholic and look under the Soyka's Timeless Media Event album. While you're there, you might want to Like my page so you'll receive updates on all my adventures, plus other great deals and heads up! Of the starters, one of my favorites came from the classic menu and the other from the new. Being a Tuna Tartare fan, I enjoyed Soyka's refreshing version. It came topped with wakame salad, and avocado; bathed in a soy ginger dressing and served with a rosemary crostini. The Watermelon Feta was cool and tasty as well; a nice balance of sweet and salty. The squares of feta cheese were piled between chunks of seedless baby watermelon, while sitting on hydroponic arugula. Drizzles of fresh mint topped the delicious pyramid. In the picture to the right, you will also see the Quinoa Salad that was served on the same plate. Another hit for me was the Black Risotto. It was a perfect preparation of carnaroli rice, squid ink, grilled scallions and lobster sauce, with a delicately flavored and mildly sweet jumbo scallop. Now that's what I'm talking about! I'll be looking for that from the right side of the menu on my next visit! Fast forward me now (or rewind me) to a classic: the Sesame Salmon. While nothing out of this world in its preparation, it tasted really good. The salmon was fresh and naturally buttery, and I enjoyed the flavor of the sweet soy with the combination of shiitake mushrooms, red peppers and spinach. Mmmm! The salmon was served on a bed of jasmine rice. Finally, call me traditional, but I have to tell you I absolutely loved the Meat Loaf. I can really see why this comfort food is a Soyka tradition. The meat was flavorful, juicy and tender and it was served with green beans and mashed potatoes with gravy. A dish that you must definitely try if you haven't already. Unfortunately, I can't say that either of the desserts impressed me very much. The Soyka Classic I sampled was the Sticky Date Pudding and the new addition was the Cream Puff. Neither truly captivated me with its taste or texture. I feel Soyka's decision to revamp its menu by creating a balance between traditional favorites and novel dishes is definitely Timeless. It provides a variety of selections that can be enjoyed by all, regardless of the preference of their palates. By incorporating American comfort food, with a more contemporary fusion of flavors in tune with the Miami dining scene, Soyka has opened the doors to a new era. 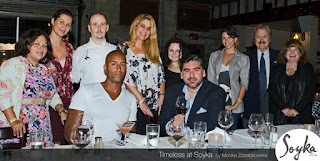 For a look through Soyka's entire updated menu, or for more information, you can contact them at 305-759-3117 or visit them online at http://www.soykarestaurant.com/.